A few weeks ago I was reading up on one of my all-time favorite anime series: Lain. The wikipedia article on Lain has a lot of good information, as well as links to additional good articles. Felicity J. Colman wrote an interesting article entitled The Sight of Your God Disturbs Me: Questioning the Post-Christian Bodies of Buffy, Lain, and Goerge (link). Another, and shorter, piece of interest is an interview with the series' producer called Lain Men: Yasuyuki Ueda (link). All this reading gave me new insights into the series, and it reignited my interest in watching it again. Surprisingly enough, it's only been the third or fourth time that I have seen it. My thinking has been that I didn't want to watch it too much, lest I become bored with it and the work loose its vibrancy in my mind. My previous times of watching Lain were also primarily in English. Being a predominantly visual work, the dialog is sometimes limited, and so I wanted to focus on the visual aspects without the distraction of subtitles. I decided to approach watching the series a little differently this time. My determination was to see it in its entirety in Japanese, and to pay special attention to all the little visual clues as well. Armed with the knowledge of my previous research and experience with Lain, I set out to discover further uncharted dimensions within its frames. After only a few episodes, I had already found new knowledge in this anime and was enthusiastic to see what else I might discover. By the end of it all, I realized that I had a much better grasp on this work than at any other time of having viewed it. So all that reading really did do some good. Now, I'm not going to give you an analysis of the whole series here, as that is something each person should come to on their own. What I can do, is to describe some of my impressions at this point. 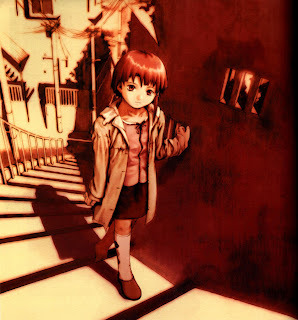 Unlike the first time I saw Lain, which filled me with sadness, this time I thought it much more positive. Most of the good anime out there seems to be filled with sadness to me, and I think it's easier to see this in Lain than many other series. Yet knowing who Lain is, and understanding her role in the series, helps to dispel some of this gloom. Unfortunately, coming to know her character on this level isn't really possible without having seen the series more than once. Once you get past the ever-present barrage of emotions in Lain, the heart of the matter becomes evident. Lain is about identity. It's about personal identity as much as national and human identity. This seems fairly logical given what I know of Japanese culture and of the statements made by the series' creators. The one thing which still fascinates me the most about Lain is, as previously mentioned, its visual vocabulary. Much, if not most, of what each episode tries to communicate is done visually. Dialogue is limited, and sometimes even background music is absent with little more than the hum of electrical lines left for ambiance. As a visual artist, this is of inherent interest to me. Yoshitoshi Abe created a world where every color choice, every compositional element, and every movement is of great significance. Blink, and you may have already missed a piece of the puzzle, a clue crucial to the story. Questionable patterns in the shadows serve as a constant reminder that things are not as they seem. High contrast scenes, juxtaposing power lines against natural or suburban imagery, speak of the barrier between the wired and the "real" world. In the end, the only thing that remains clear throughout Lain is that all things are subjective and relative, while existential questions are left without definite resolution. 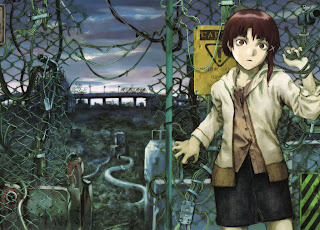 To me, Lain will always be a masterpiece of Japanese animation. Hideaki Anno may think that "over the past 12 years, there has been no anime newer than Eva," (link) but I beg to differ. 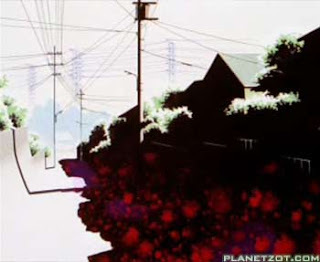 Lain may share some motifs with Evangelion, but I find it a more mature and intelligent approach to the issues at hand. 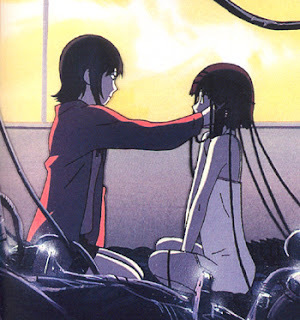 Not to mention that Lain's execution and artistry put it in a class of its own.